White Singers In Hungary Claim To Be African-American, For An Opera The Gershwin estate stipulates that Porgy and Bess should be performed by an all-black cast. The Hungarian State Opera in Budapest reportedly asked its mostly white cast to say that they are black. Performers rehearse in January 2018 for the controversial Hungarian State Opera production of George Gershwin's opera Porgy and Bess. In January 2018, the Hungarian State Opera in Budapest was widely criticized for staging the George Gershwin opera Porgy and Bess — whose story wrestles with racism, drug abuse and poverty — with a predominantly white cast, despite the fact that the Gershwin estate requires performances to feature an all-black cast. Now, the Hungarian production is back for another series of performances of Porgy this month — and its nearly all-white cast was reportedly asked to sign testimonials saying that they were African-American. The Hungarian news website Index said that it had obtained the statement, and published it last Friday. According to Index, it reads: "African-American origin and consciousness are an integral part of my identity. That's why I am especially pleased to be able to play George Gershwin's Porgy and Bess." The Hungarian television network ATV reported that a majority of the cast — 15 out 28 performers— signed the statement. The request for such an affidavit was allegedly made by the company's general director, Szilveszter Ókovács. The performances in Budapest, which continue through next Wednesday night, bear a disclaimer of sorts on the opera company's website and in the venue: "The manner in which this production of Porgy and Bess is being produced is unauthorized and is contrary to the requirements for the presentation of the work." Index approached Ókovács about the race affidavit. He responded with a lengthy set of questions of his own, including: "What is the color of all black cast on the Pantone scale? One [sic] of Barack Obama's grandparents was 'white': would he think he would be right in Porgy and Bess? Can you do that at all? ... George Gershwin, [from] a Ukrainian Jewish family migrating to America, would not be allowed on the stage of his own work because of his skin color and / or origin and with reference to him. Do you find this okay? ... Do you not think that this whole rotten and odorous provision should be ignored by all opera houses?" 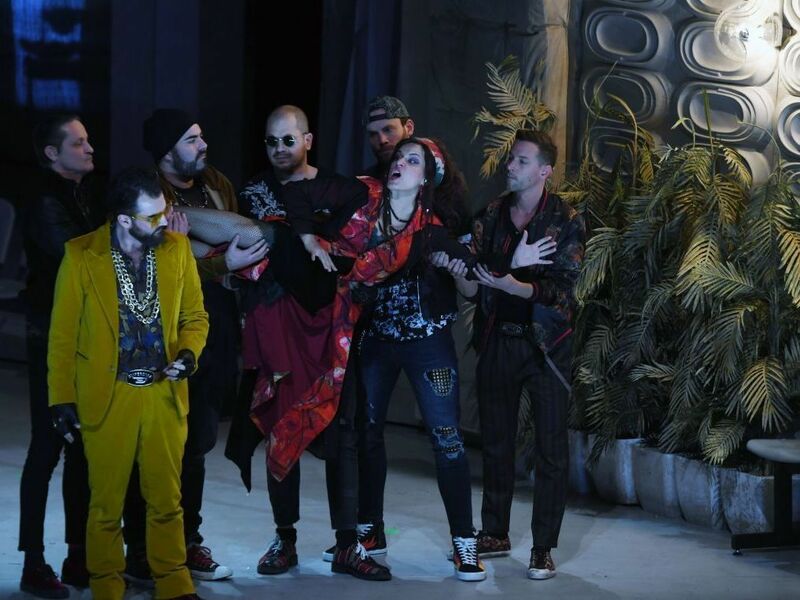 For the Hungarian production, director András Almási-Tóth moved the opera's setting to an airplane hangar, with the characters shifted to be refugees from an unnamed place and crisis. "This piece [has] almost disappeared from the world of opera for the well-known legal restrictions," Almási-Tóth said in a promotional trailer for the production posted in January 2018. "Now we will have a sort of non-replica production, as we do not need to have an all-black cast." On the Hungarian opera company's website, there is a small section marked "The critics respond," with a quote from a single Hungarian reviewer, who argues, in essence, that Porgy is too important — and, oddly, "melodious" — to have its performances restricted to black artists. In New York, the Metropolitan Opera will open its 2019-20 season in September with a new production of Porgy -- the work's first presentation at the house in almost three decades. The Met is hiring an all-black chorus for the Porgy performances; its regular chorus currently includes six black singers out of about 81 total. "Certainly it's more complicated, but it's worth the complications because it's such a great piece," Met general manager Peter Gelb told the AP. There's a complex history there, too: George Gershwin turned down a Met commission for Porgy and Bess in 1935, because the New York company wanted to use its white chorus singers performing in blackface. Instead, the work premiered in Boston before moving to Broadway. Last June, the Hungarian State Opera canceled 15 performances of Billy Elliot, the musical about a young boy growing up in an English coal-mining community who dreams of becoming a ballet dancer. Just before the show was scheduled to start its run, an article in the conservative newspaper Magyar Idők called the show "pointed and unrestrained gay propaganda." The paper is aligned with the government of the country's nationalist, hard-right prime minister Viktor Orban; according to the BBC, the same newspaper has published attacks against a variety of "liberal, globalist and cosmopolitan ideas" that it says is encoded in a variety of Hungarian media platforms and institutions, including the Hungarian Academy of Sciences and the official state news agency. The Billy Elliot production was also overseen by Ókovács.